Showing results for tags 'lambda'. Hey guys and girls! First post here but I’ve been looking through these forums for a couple months now and they’ve been so useful! Absolutely love my Polo 6N2, my first car and I couldn’t be happier! But I do have one reoccurring problem which is really starting to annoy me. I keep getting a check engine light come on, and after scanning the ECU I get the following code: P0134 - O2 Sensor Circuit No Activity Detected (Bank 1 Sensor 1) Got my local mechanic to replace the lambda sensor. Car worked perfect for a couple weeks until I got another P0134. He said that the part was faulty (its a genuine Bosch part cost me £130) and he replaced it. Now a couple months later I’m getting the P0134 error again and the lambda sensor is not working (poor economy, poor performance). I thought originally it could be wiring related but since the new sensor worked for a couple months I thought it must be the sensor. I don’t know what to do and I doubt my mechanic is going to replace the part again (he always wants the car in for ‘diagnostics’ and basically hates my pride and joy). Side note: recently under hard acceleration every now and again cylinder 3 will misfire (assume I need to fit new spark plugs in). Could this in anyway cause the lambda to fail? Really annoying that the car is currently slower than usual and burning a lot more fuel (passengers always complain of fuel smell) Thank you so much for reading! Diag Test Values MaxiDAS DS808 what should they be? 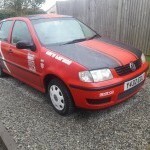 Hi all, I was hoping my first thread to be me starting with my Polo project, but that needs to wait until I fix my other Polo, for which I need a bit of help as a quick search didn't pan out :( Basically the troublesome Polo has issues with cold start. It starts and cuts off almost immediately. After 5 minutes of struggle to rev it, it manages to stay on, and after a while (as it warms up), there is no problem with starting it again... Starting it directly on LPG also has no issues. So generally I though the petrol pump was bust, but I checked with another one, and there is no difference. The only error it has is about the lambda sensor. It had it way before any issues where presented. At some point the catalytic converter was also removed. The throttle body is also clean and working properly. So as I have another 6n2 Polo with the same engine, I wanted to swap the lambda sensors and check if it would change anything. We only managed to swap the MAP sensors and make sure it is not from them, as the lambda sensors apparently are different. So the question at the moment is why are they different? The troublesome Polo is using a square plug sensor, where the other one is using the way cheaper flat plug sensor :) If I get a flat one for the troublesome Polo and just rewire the plug will it work, as this is normally done with other vehicles, using universal lambda sensors with the existing original wiring? Hi, I own a 1.2 9n3 Polo (55 plate) I bought it in July 2015 and in October 2015, the check engine light came on. After taking it into a local garage and having it looked at by the mechanic, I was told I would need a new Catalytic Converter. I was also told that for the warranty, I would need both sensors replaced as well. So after nearly £400, it should now all be fixed. The invoice read that a new cat was supplied and an fitted as well as two o2 sensors and the p0420 code was read and cleared. Two days ago the check engine light has came on again. This time, I have an OBD-II reader and plugged that in. The reader showed one error code, p0420, the same as last time. So as it stands I am potentially looking at the replacement cat having failed only 13 months on from being fitted. I'm hoping that someone can help shed some more light on this situation for me so that I am not spending over the odds on repairs that are not needed. As far as I am aware, the cat is aftermarket. I was wondering if these come with a specific kind of warranty with them? (I asked a different local garage yesterday and was told that most exhaust parts should come with a two year warranty - is this true?). If it is covered under warranty, is it for the garage who carried out the repair to replace at no extra cost or would I have to pay the labour? Is there anything I can try out first before paying for another repair? Is it okay to drive still and is it worth taking it out on a drive to try and clear it if anything has built up? Are there any checks I can carry out to try and single out the problem? Thanks! Marco Polo is dying - help desperately needed! Hey guys, So third month of owning the car and now running into issues. The exhaust warning light is now coming on intermittently. (2 days on, 5 days off). Had it diagnosed off a mechanic who said "the fuel ratio is too rich probably a wiring problem". Anyone got any ideas on this? Read into a lot of things about lambda sensor needing replacing etc. Currently doing about 390 miles a week and filling it up about 39 litres per week. Nearly all of it is motorway driving. The car is a 2006 Polo 1.2 E55 9N3. Looking to sell the car in June, afraid it may fail its MOT in May on emissions although last one was fine Hoping this light won't be an issue when I come to sell it.